The Rollie Free story is one of perseverance, guts and revenge. It is arguably the most famous photograph in motorcycling. 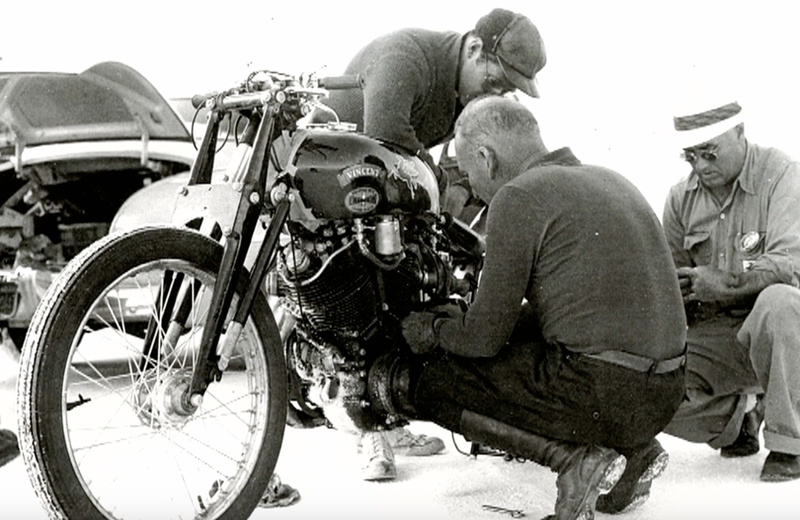 In 1948 a man, wearing only a bathing suit and shoes, stretched prone on a speeding motorcycle and set the world’s motorcycle land speed record on the Bonneville Salt Flats in the United States. While the photograph was snapped in less than one one-hundredth of a second, this achievement was the product of years of preparation. It was also the product of an unusual union of two very different men. One came from a world of privilege and the other from blue-collar middle-America. Their bond was their fierce determination, particularly a desire to beat the Harley Davidson motorcycle company. This is the story of Rollie Free, John Edgar, and the Vincent Black Lightning. Roland “Rollie” Free (November 18, 1900 – October 11, 1984) was a motorcycle racer best known for breaking the American motorcycle land speed record in 1948 on the Bonneville Salt Flats, in Utah. 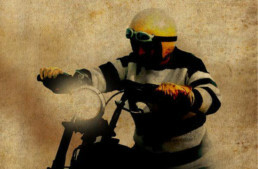 The picture of Free, prone and wearing a bathing suit, has been described as the most famous picture in motorcycling. After an early career in motorcycle retail, Free became a regional racer of the 1920s and 30’s on Indian motorcycles. 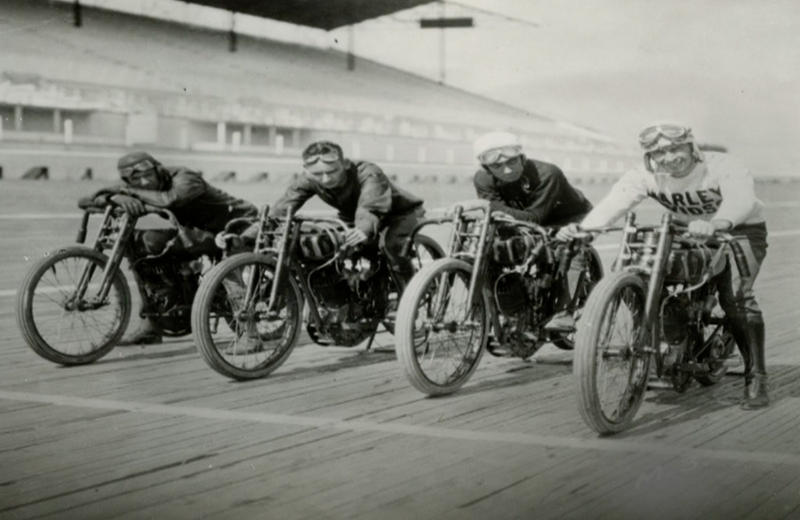 In 1923, Free tried out for his first national motorcycle race, the 100-Mile National Championships on the board track in Kansas City, but did not qualify. He developed his career in longer-distance events, and raced in the very first Daytona 200 on the Daytona Beach Road Course in 1937. He also set several American Motorcyclist Association Class C speed records including a 111.55 mph run at Daytona in 1938 on an Indian Chief that he had tuned himself. On the morning of September 13, 1948, Free raised the American motorcycle speed record by riding the very first Vincent Black Lightning HRD, owned by the California sportsman John Edgar and sponsored by Mobil Oil, to a speed of 150.313 mph (241.905 km/h). Special features included the first-ever Vincent use of a rear shock absorber, the first Mk II racing cams, and horizontally mounted racing carburetors. Free adopted a style used by others of lying flat prone along the machine’s back spine, thereby minimizing wind resistance and placing more weight over the rear wheel. It is generally believed that this bike is The First Lightning though, a custom order from the factory and was some 100 pounds lighter and 25 hp more powerful than the stock Black Shadow. In one of his books, Phil Irving (one of the designers) said that there were only about 16 of the model produced. The Black Lightning is the fastest Vincent ever produced. To protect himself and allow comfort when in such a position, Free had developed special protective clothing. 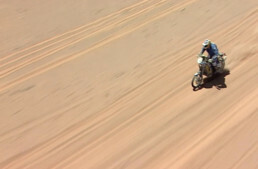 However, when his leathers tore from early runs at 147 mph (237 km/h), he discarded them and made a final attempt without jacket, pants, gloves, boots or helmet. Free lay flat on the motorcycle wearing only a bathing suit, a shower cap, and a pair of borrowed sneakers – inspired by friend Ed Kretz. This resulted not only in the record, but also one of the most famous photographs in motorcycling history, the “bathing suit bike” shot taken from a speeding car alongside his run on the Bonneville Salt Flats in Utah. The Vincent used is sometimes mistaken for a Series B machine, having the stamp BB on its engine casing – but is actually a works-modified machine, and recognized as the first, or prototype of 30 Lightnings. 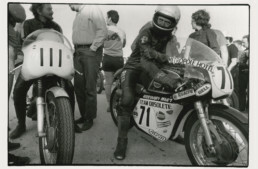 The bike remained racing in the United States until the mid-1960s, and then resided virtually intact in the private collection of Herb Harris of Austin, Texas until acquired by the William E. Connor collection. Free later moved to California and, after his racing career faded, worked in the auto servicing industry. He died in 1984 and was posthumously inducted into the Motorcycle Hall of Fame in 1998.